The Mil Mi-12 (NATO designation, Homer) is a very heavy lift helicopter. It uses two main rotors that each spin in opposite directions. The engines and rotors were mounted on two relatively small wings. The model was capable of lifting a huge amount of cargo. It took a flight crew of six to operate this flying machine. Similar to the heavy lifter Mi-10, the Mi-12 also uses the engine, transmission and rotor system from the Mi-6. There were two prototypes built, the first of which flew in 1967. It took until 1973 before the second one joined the test program. 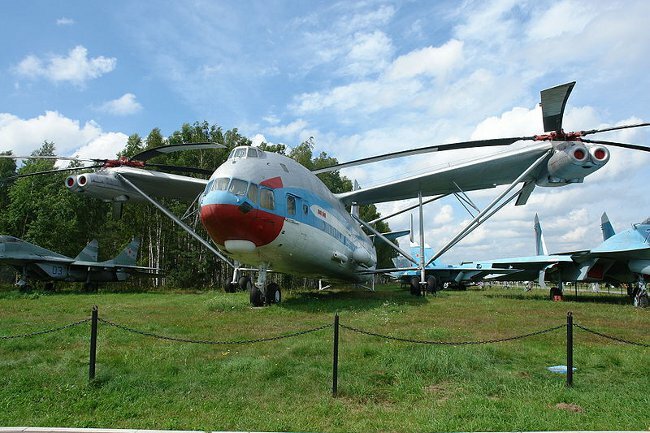 However, the Mi-12 never entered into production due to its very high unit costs and because better alternatives were emerging in the early 1970s. In particular, the Mi-26, which was based on a conventional helicopter layout with a much improved transmission and engine technology, would turn out to be a 'leaner' and more effective solution to the heavy lifting challenge. All this rendered the Mi-12 obsolete before it could even enter into service. Do you want to comment the Mil Mi-12 / Homer helicopter?